Lots of horses share common ancestry, or have been crossed together over the years to create the breeds we know and love today. There are many similarities between these three horses – have a read through Arabian vs Quarter Horse vs Thoroughbred to see which one would suit you the best. 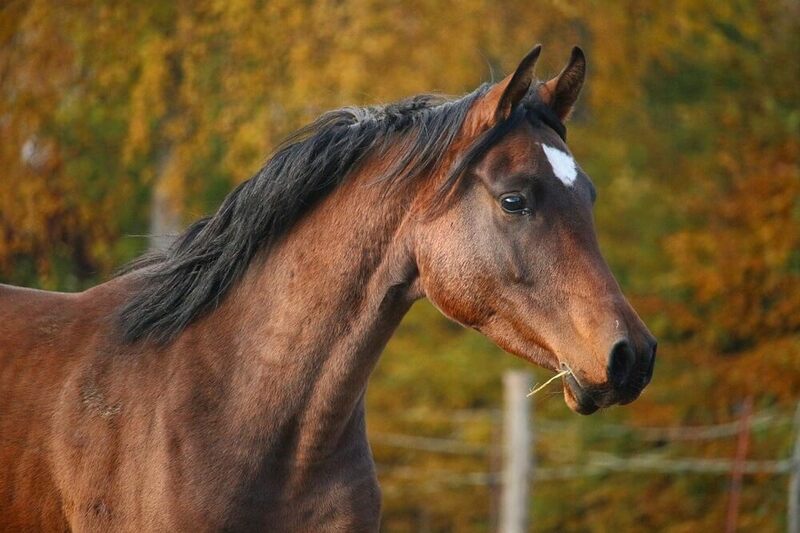 The Arabian is one of the oldest breeds of horse today, with archaeological evidence dating back over 4,000 years. The Bedouin people may have first domesticated the Arabian horse in the deserts of the Middle East around 4,000-5,000 years ago, but hard fact is absent in this case. Regardless of who or what created the Arabian, climate and culture has led to the breed we know and love today. The desert is a harsh environment, and horses would have relied on humans for food and water and care – to the point that prized mares were often brought inside the family tent to keep them safe from marauders and predators. The American Quarter Horse’s name comes from its ability to outdistance other horse breeds in ¼ mile races. It is the most popular breed in the US today, and there are over 3 million Quarter Horses registered. The Quarter Horse came about through breeding between the Thoroughbred and “native” horses in the US, which in turn came from horses descended from Spanish stock. Quarter horses (due to being crossed with Western horses as well as Mustangs), had an innate “cattle sense” making them perfect for workers on ranches on the newly settled new world. The Thoroughbred is perhaps one of the most well known horse breeds, because it is the main breed used in horse racing. Racing has been going on for centuries; as far back as 1174 it has been documented! The thoroughbred breed as we know it is influenced by Oriental stallions such as the Arabian, Barb and the Turk, and all Thoroughbreds today trace their roots back to three stallions imported to England from the Middle East. The official stud book for the breed was created in 1791. Between 14.1 and 15.1 is the standard for Arab horses, with the occasional allowance of one standing slightly over or under this marker. All Arabs are considered horses rather than ponies, regardless of their actual height – despite the general cut off being 14.2 hands. Quarter horses generally stand between 14 and 15 hands, though some types can reach as tall as 17 hands (these are the type that are crossed with English hunter type horses). In the 1700s, the average height of Thoroughbreds was about 13.3 hands; the breed has increased dramatically in height since then! Generally of an average size, Thoroughbreds vary from 15.1 to 17 hands. Purebred Arabs are generally bay, grey, chestnut, black or roan. Black is the least common color, and roan is a funny one. “Roan” Arabs don’t have the genetic roan coloring, rather a partial roan like coloring on the mid section and flanks only. Quarter Horses are usually a brownish red, or sorrel, color. Many other colors are recognized, and until recently spots were excluded but this has been updated with the advent of DNA testing – as long as both parents are registered then all colors will be considered. The most common color of a Thoroughbred is bay, brown or dark brown, though chestnut, black and gray colors do also exist in the breed. One of the most notable characteristics of the Arabian, that sets it apart from all other breeds except the Welsh, is the dished face. Many also have a bulge between the eyes which adds additional sinus capacity and may have helped the Arab in its native desert. Arabs also have an arched neck, a laid back shoulder and a compact body with a short back. The tail carriage is recognisably high, especially if they are excited or nervous. Quarter Horses are compact, with a short body and head. The defining feature is of course the quarters, which should be heavily muscled, powerful and strong, but the neck is fine and flexible, with a neat wide head and wide gullet, which allows wider passage for air to the lungs. Thoroughbred conformation is generally characterised by fine to medium bone, a deep chest with well angled shoulders and a lean body with long flat muscles. The haunches should be lean but powerful, for those awesome bursts of speed. 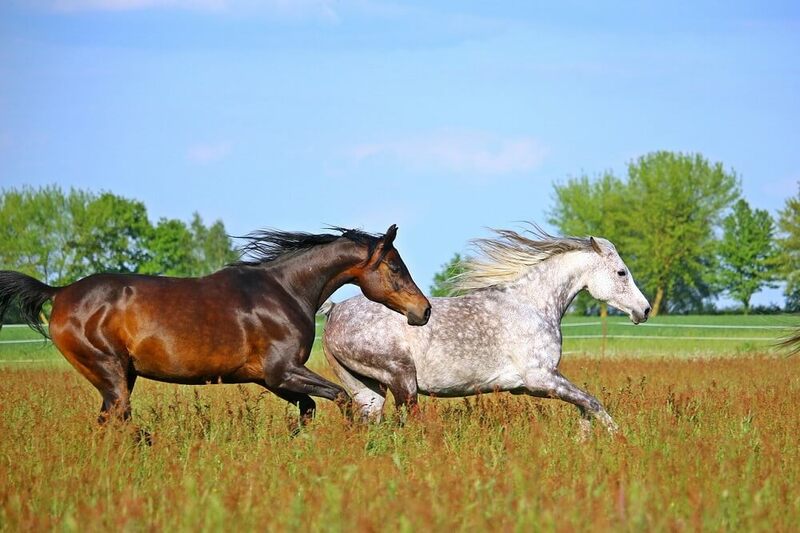 Arabian gait is ground covering and smooth, and the paces are often described as “floaty”. They are very forward going and comfortable to ride, with a low action that does not pound the ground. The forefeet seem to hover a moment before hitting the ground, which gives the impression that they are dancing on the air. Quarter horse gait is pretty standard. 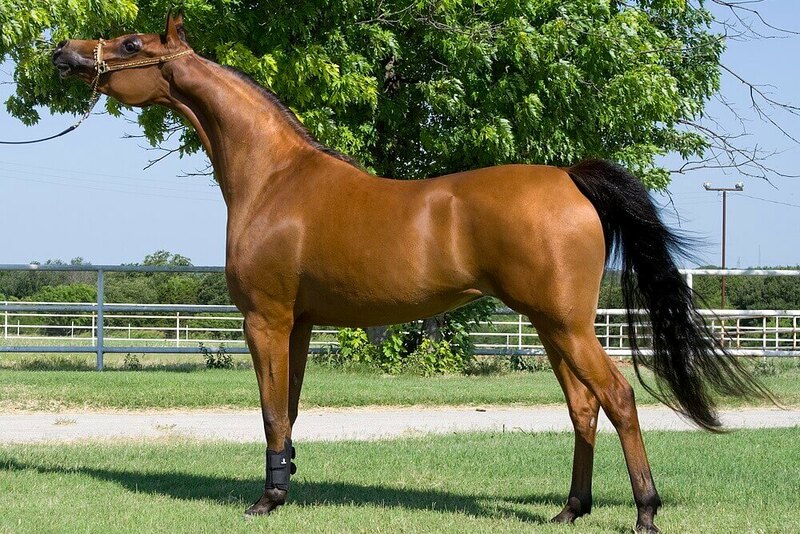 They have all the paces of other breeds, nothing stand out about it – except for the “lope” which is also known as a canter and is sought after for Western riding. Quarter horses also have a gait that is in between a walk and a trot which is very comfortable on long rides. Thoroughbred’s short leg bones give them a long, easy stride. All of their paces are smooth and flowing, and they have such immense stores of natural athleticism that it doesn’t take much to turn up the speed! Arabians are extremely intelligent. They are quick to learn, inquisitive and sensitive. Because of the centuries of human interaction and the fact that only those individuals with good temperaments were allowed to breed they are generally fantastic with people – but they are also known as a “hot” breed. This makes them more spirited than others, and can mean that they can become nervous or anxious with the wrong treatment. Quarter Horses have excellent, sensible temperaments and are not generally reactive to outside stimuli. This makes them calm, safe, and excellent mounts, along with the fact that they are easy to train. They are steady, dependable and clever – just about the best combination you could have. Thoroughbreds are another one of the “hot” spirited horses, but this is tempered by a long relationship with humans, so they are generally friendly and people-oriented. They are energetic and intelligent but can be highly strung, and do not always make the best mounts for beginners. Arabs are incredibly versatile horses. They excel in endurance riding because of their stamina, but are also fantastic for showing, jumping, in hand and driving competitions. The showy look of an Arab lends itself well to crowd pleasing, so they have been used extensively in films and parades. Arabs are also used on search and rescue teams as well as therapeutic riding. American Quarter Horses are fantastic at racing, to the point that they have been clocked at 55mph! This is what they were bred for, but they are also suitable for hunting and jumping, and of course for pleasure riding. 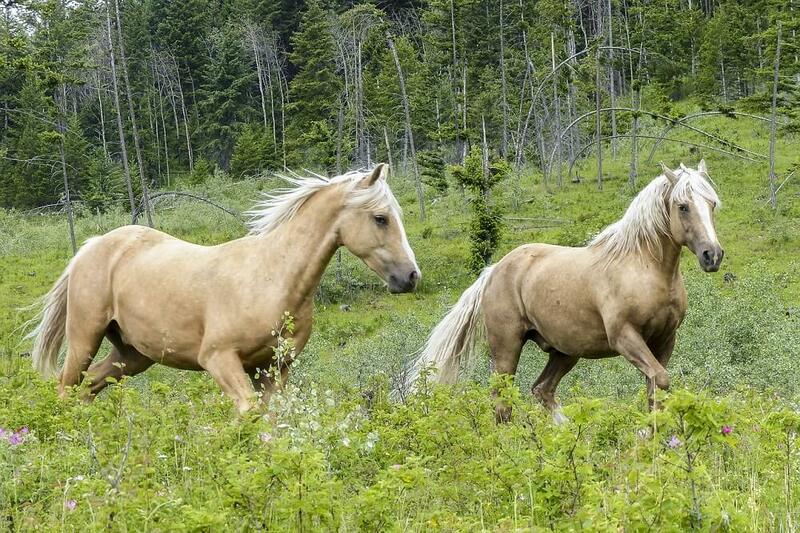 They are extremely agile, which added to their calm nature makes them ideal ponies for young riders. The thoroughbred is primarily used as a racing horse, although it also excels at other athletic sports such as showjumping, dressage and eventing. Many of the horses ridden in the Olympics or the Grand Prix are Thoroughbreds or crosses.